Sacramento State is making history as the only California university with a Vote Center on its campus for the November general election. The Vote Center in Modoc Hall, 3020 State University Drive, will be open 8 a.m.-4 p.m. Nov. 3-5, and 7 a.m.-8 p.m. on Election Day, Nov. 6. On Election Day, Associated Students Inc. (ASI) will operate a shuttle for voters from 10 a.m. to 4:30 p.m., with stops in front of Shasta Hall and near the Library Quad fountain. The south-campus location is convenient for the Sac State community, as well as neighborhood residents and commuters on Highway 50 and Folsom Boulevard. Parking is free in designated spaces. 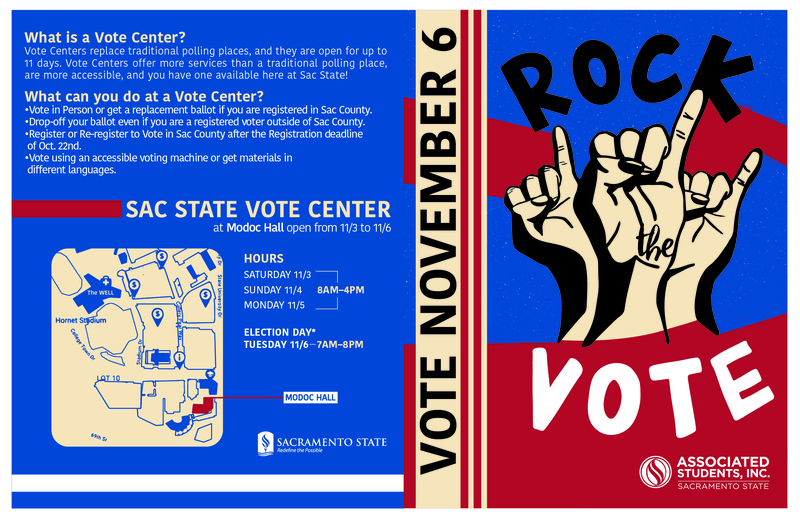 ASI, the University’s student government leadership, has adopted the Vote Center as a part of its “Rock the Vote” campaign this election season. Sacramento County is one of 14 counties allowed to conduct elections under the 2016 California Voter’s Choice Act, a model that replaces traditional polling places with Vote Centers. The idea is to make voting more accessible and convenient by opening dozens of Vote Centers and extending to multiple days the opportunities voters have to cast ballots. All registered voters have received a ballot by mail. Drop off their mail-in ballot (and save on postage). Take advantage of conditional voter registration, which allows eligible citizens to register and vote on the same day. Pick up a replacement ballot. Pick up voting material in multiple languages.